PARKING: Public underground care park on site. Self parking fee of €17 per day. 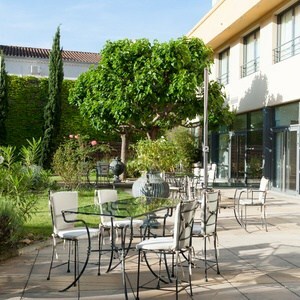 The Grand Hotel Avignon is a newly built 4* hotel ideally located to explore the rich history of Avignon. 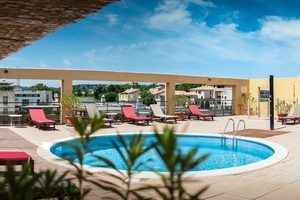 With its excellent modern facilities for both business and leisure travellers the Grand Hotel Avignon appeals to the requirements of all travellers. and is one of the most prolific areas for gothic buildings. For theatre lovers Avignon is also renowned for its theatre festival that has been running annually since 1947. The Grand Hotel also has excellent transport links as it is only 200m from the TGV station and 20 minutes from Avignon’s airport. Designed to accommodate all tastes the Grand Hotel Avignon has a wide variety of facilities from conference rooms to a beautiful outdoor swimming pool. The restaurant serves traditional French cuisine with a bar for pre and post dinner drinks. With both a terrace and garden there are plenty of places to admire the views and soak up the rays from the Provence’s typically hot sun. Offering facilities for children and for pets the Grand Hotel Avignon is also ideal for a family holiday. All rooms in the Grand Hotel Avignon are spacious with rich furnishings.and full hotel facilities. Two grades of rooms are avaliable and self catered apartments are also provided. The standard double room has a double bed, minibar, internet access and an ensuite bathroom with the superior rooms adding a sitting area, a queen bed and a larger ensuite.